When in contact with water, individual particles of the hydrophilic polymer immediately begin to swell. The surfaces of these gradually swelling particles cross-link to form a tough outer skin which prevents the completion of the hydration process. The result is an agglomeration of particles which are wetted on the outside only. These appear at best as small transparent “fisheyes” but more normally as lumps of varying sizes. Should one attempt to achieve an homogeneous dispersion by smoothing out the lumps by means of high shear methods, the polymer molecular chain may be broken. This will effect the end result considerably by altering the desired characteristics of the finished product. The thickener or gelling agent is sucked out of a hopper, bigbag or a silo into an injection chamber where it is pre-wetted by the liquid phase. This pre-wetting process is guaranteed to happen without sticking. The forced passage through the rotor-stator-system ensures a perfectly wetted out product. 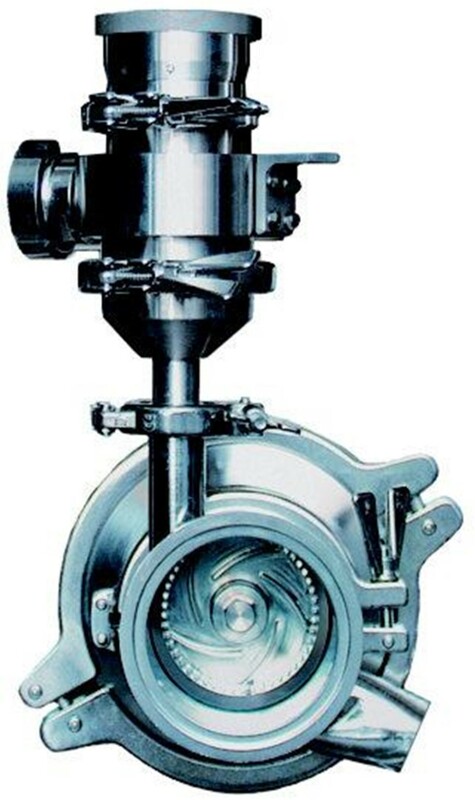 A pump installed downstream achieves a controlled discharge of the product. Sticking powders, deposits or lump formation on the contact surfaces of the powder/liquid injection chamber are totally eliminated during either continuous or short process intervals.